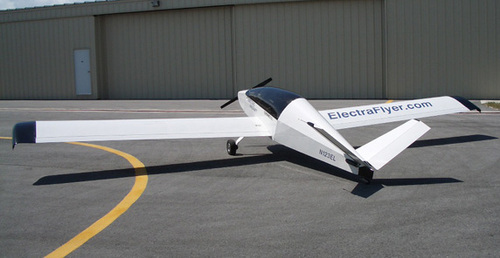 Electraflyer.com a small company known for making electric powerplants for trike uptralights (wheeled hang-gliders with a motor), have just announced the successful conversion of a Moni Motorgliders to a small electric airplane, using off the shelf kit parts and their largest battery pack. Pipistrel have just announced the worlds first electric motor glider. They expect to start delivering these in the fall of 2008. The glider will be able to climb 6000 feet on a full charge with two onboard. Im already a lover of the Stemme 10VT motorglider, last flight in it we only did run the engine for about 15 minutes before doing a 400km flight in about 4.5 hours. PC Arero in Germany just put another electric entry together.